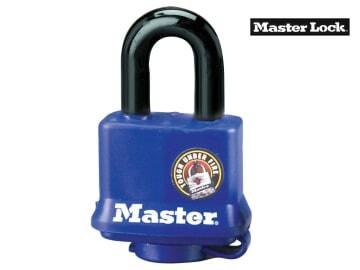 The Masterlock Weather Tough® Padlocks have a laminated steel body with the addition of complete body protection from the elements. The high tech thermoplastic cover keeps the entire padlock, including the shackle, protected from the elements. The additional quick snap-on cap protects the lock mechanism from weather, dust, dirt and sand, helping to maintain the mechanism for longer. Suggested Uses: Sheds, residential gates or garages. 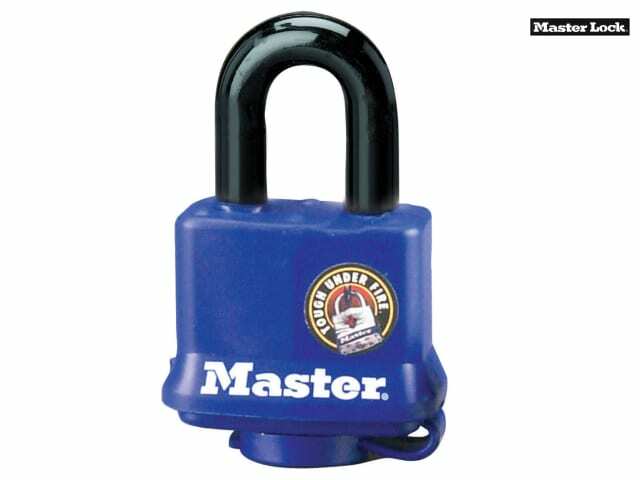 40mm laminated steel padlock with blue thermoplastic cover, 25mm hardened steel shackle, 10mm diameter with black thermoplastic cover - 4-pins.